Tokyo skytree （東京スカイツリー） is the highest bloadcasting tower in the world. The height of this tower is 634m (634 can be read "Musashi" in Japanese, and Museshi is one of the old name of Tokyo), and two observation deckes are established at heights of 350m and 450m. 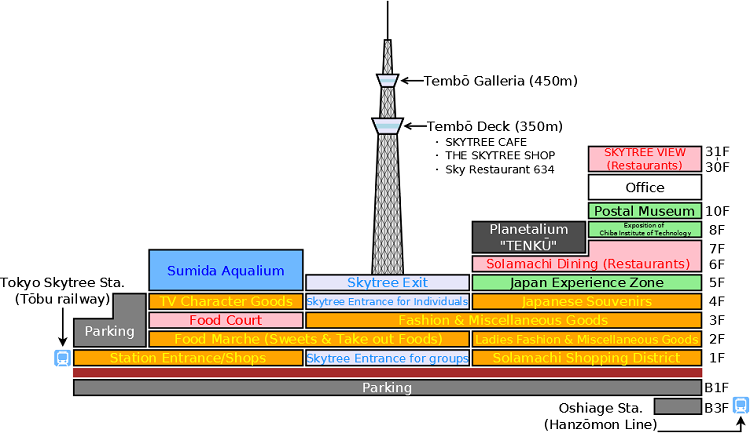 At the base of skytree, a huge shopping complex called Tokyo solamachi （東京ソラマチ、Tokyo solamachi） is located. Of corse, numerous shops and restaurants open in Tokyo soramachi. In addition to that, soramachi includes one aqualium (Sumida aqualium) and planetalium (TENKŪ). When the weather condition is but (e.g. strong wind), Skytree is closed. Tickets to Tembō Deck is sold at Ticket Counter (4th floor). If you want to go to Tembō Galleria, you need to buy both tickets to Tembō Deck and Tembō Galleria. Tickets to Tembō Galleria is sold at Tembō Deck. If you want to buy advance tickets, you need to have a credit crad that was issued in Japan, and buy from this site (Japanese site). Persons with disabilities can get about harf discounts. 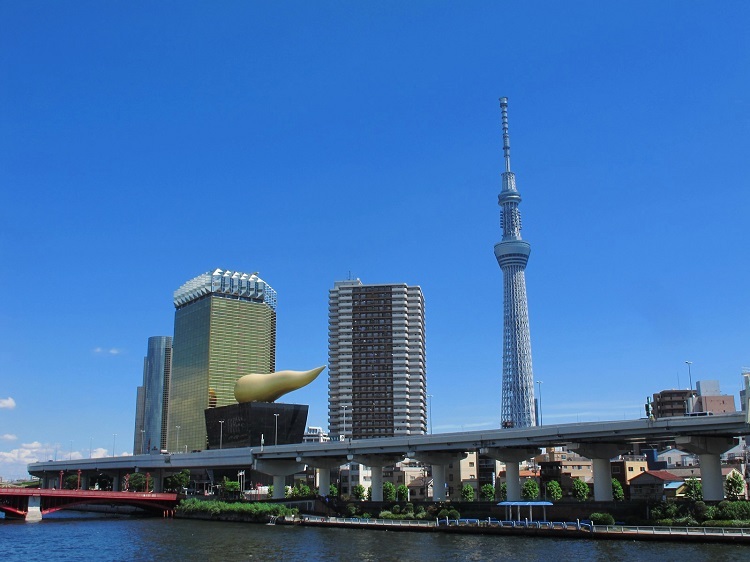 Tokyo Skytree was built in 2012, but many tourists visit there even now. Especially on weekends, national holidays and holiday season, the admission is sometimes restricted because of the crowdedness. Normally, Skytree begins to be crowded after 10 a.m.. The peak time is around noon, and more than 1 hour is needed to buy tickets at the that time. Conversely, there are few visitors between 8 a.m. to 10 a.m., and you can buy tickets without waiting. Also, after 20 p.m., the number of visitors is small relatively.